Once upon a time there were three children named Violet, Clause, and Sunny Baudelaire. 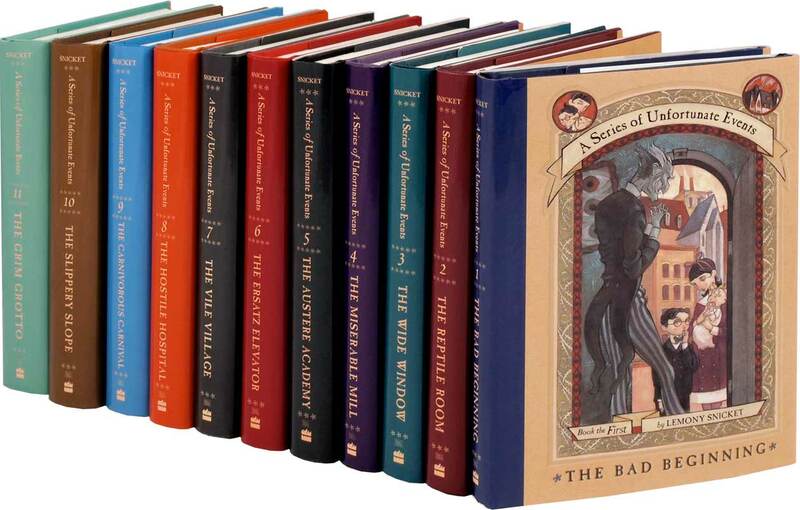 They had terrible lives.There is a series of books written about them called “A Series of Unfortunate Events.” At the beginning of the first book their parents die. Things only got worse from there. At the end of the last book you as the reader are not quite certain as to whether they ended up okay or not. You should read these books. My sister read one and hated it. It was so depressing, she said. But there is an underlying humor and optimism to the depressingness of the story line. That, however, is not why I love the books. There are three reasons, actually. First, the setting. I have no idea what era the book is supposed to be set in, but I think it’s the same era as the games we used to play as kids, where our evil aunt locks us in an attic and some handsome prince rescues us and then we ride away on his motorcycle. It is true that in this city there are both horse-drawn carriages and motorcycles, top hats and running shoes, masquerade balls and movie theaters. Oh and there is a Duchess and a Count and a submarine and one computer is mentioned but the main ways of communication are cool sneaky things like hand-written letters, telegraphs, and coded messages hidden in movies. It is the coolest setting ever. Second, the secret agency. There is a secret agency that shows up somewhere around book 4. They have secret passageways and communicate by placing food a certain way in a refrigerator and hide very important things in a sugar bowl. It is never clear exactly what VFD does besides do good things and put out fires and keep terrible things from happening but it is all so cool and secret and I just know that I was destined to belong to that secret agency. Also, they have balls and tea parties and once they had a lady wearing a dress that looked like fire. She danced in a fireplace so that people would think she was just a fire and she could evesdrop. The coolest secret agency ever. The one we all wished we could belong to as kids. Lastly, comes Lemony Snicket himself. He is not only the author of the books, he is a character in the books. The main characters never meet him in person. They do, however, meet his siblings, his true love, and see a blurred picture of him. Thus endeth my book review. Wow, so there’s a book series? You’ve got me interested. The movie is terrific.